BFI Player introduces this wonderful film of a hockey match played on Christmas Day at Rhyl in 1920 with: “Happy Festive Hockey” and the players do seem to be having lots of fun. “The weather seems good, with no-one shivering in their kit – though the women do wear hats. There is no Christmassy setting of snow or any other seasonal prop in evidence at this hockey match for ‘mixed ladies and gentlemen’, where banter and banjo-mimicking seems to engage both sides’ participants as much as bully-off and dab-hand dribbling. Meeting, not beating, seems to be the point here. 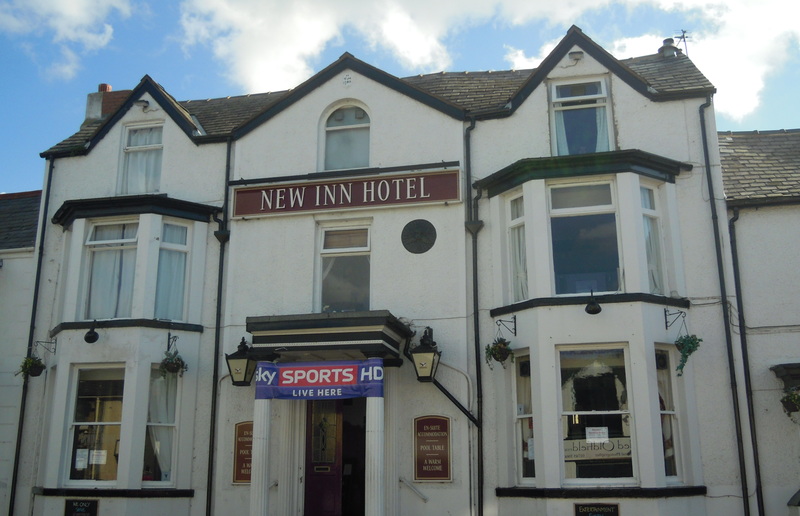 The local paper reported that a hockey match was played on Grange Road between Rhyl Mixed (five ladies and six men) and Grosvenor Ladies (assisted by four men) on Christmas Day, the score was 1-1. Presumably this is the same match – take a look at the film, the Claremont Hydro (Y Gorlan) can be clearly seen and is that St. Winifred’s with the tower? Is that the railway running between the pitch and the Claremont? So is this Grange Road, where Elwy Drive is today? How nice to have local sporting fixtures arranged on Christmas Day. A time when such simple things didn’t have to compete with everything that is on offer today. A cycling club in Rhyl goes back as far as 1879. 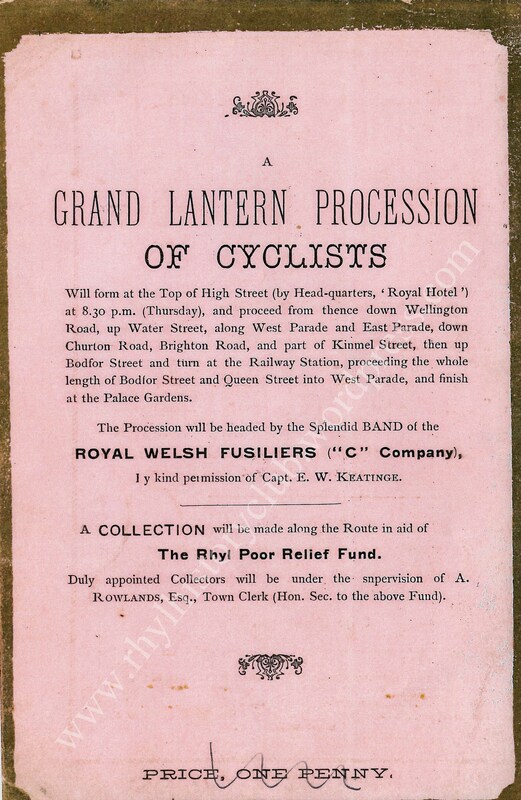 The Rhyl Advertiser reported that a meeting of “Bicyclists” was held at 8 pm on Monday, April 28th, of that year at Reynolds’ Assembly Room, where it was decided to form a club to be named “Rhyl XL Bicycle Club”. 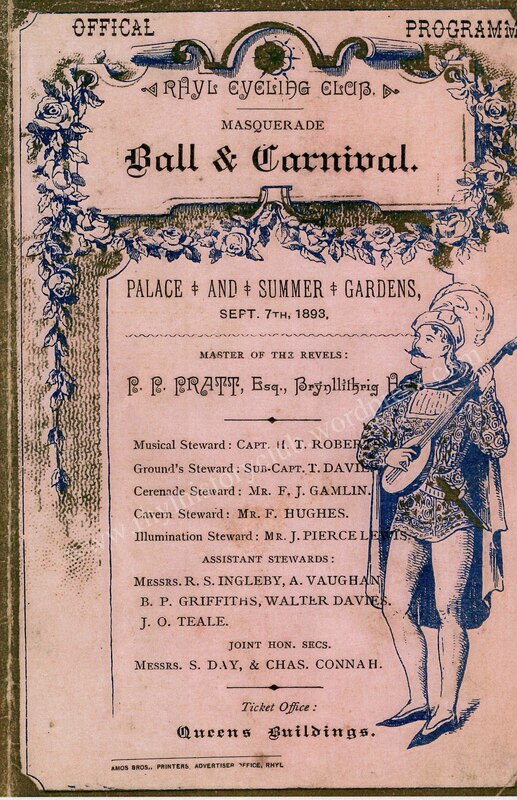 The annual subscription was set at five shillings, and the entrance at two shillings and sixpence. All candidates for membership were to be elected by ballot. 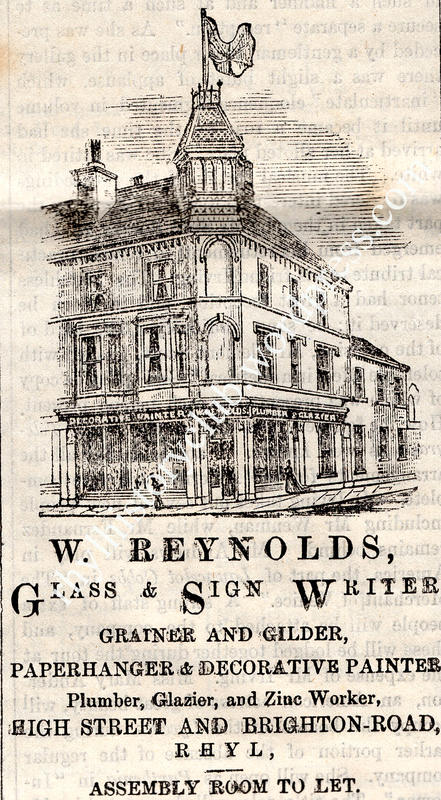 Reynolds Assembly Rooms were located in the building, on the corner of High Street and Brighton Road, that was occupied by the William Roberts’ shop for so many years. We still love our cycling in Rhyl, click to read about Rhyl Cycling Club, and the Bike Hub, and Marsh Tracks. 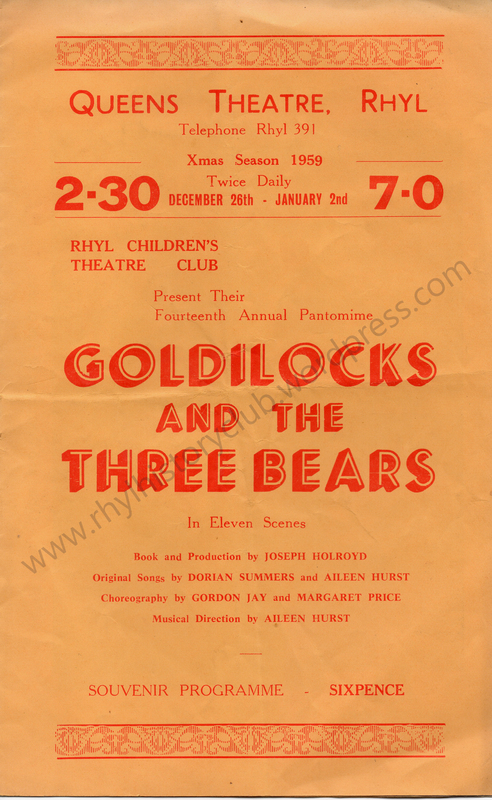 There was plenty going on in Rhyl during the Christmas period of 1959. 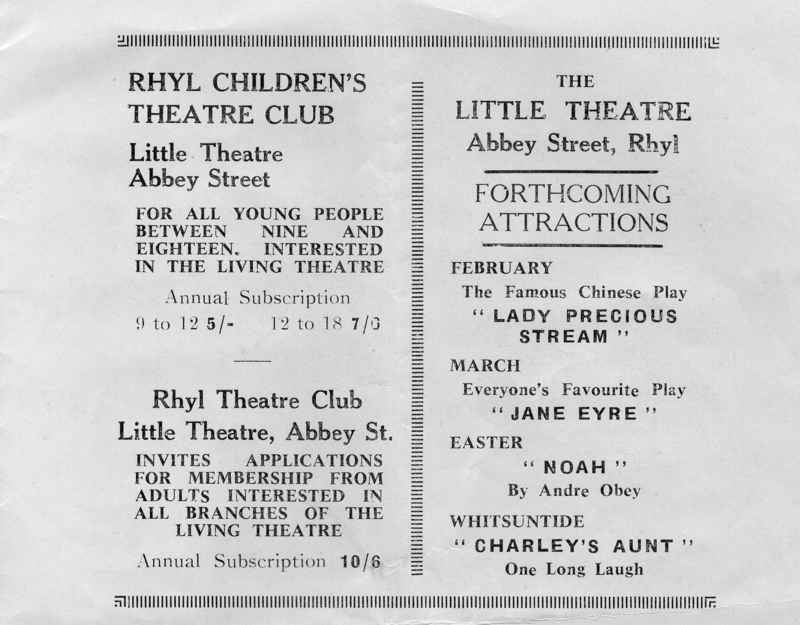 The front pages of the December issues of the Rhyl Journal and Advertiser had advertisements for a wide array of entertainment. The Ritz Ballroom was advertising dances on Christmas Eve, Boxing Night and New Year’s Eve. 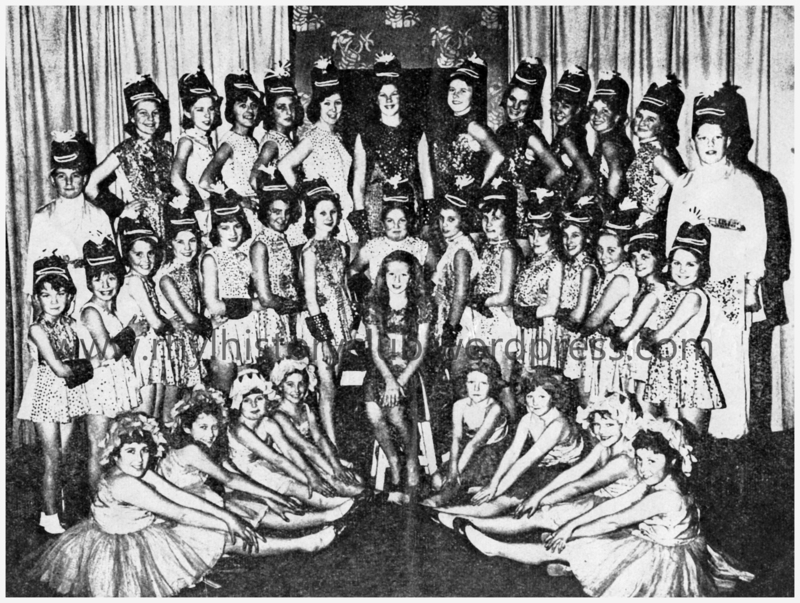 At the Regent Ballroom there was “Merry Xmas Dancing” – a Grand Xmas Eve Carnival, a Grand Boxing Night Carnival and a New Year’s Eve Carnival Ball. The Pavilion featured too – the Flint and Denbigh Hunt Supporters’ Dance was advertised for December 4th and Rhyl Rugby Club promoted their New Year’s Eve Annual Carnival Ball. 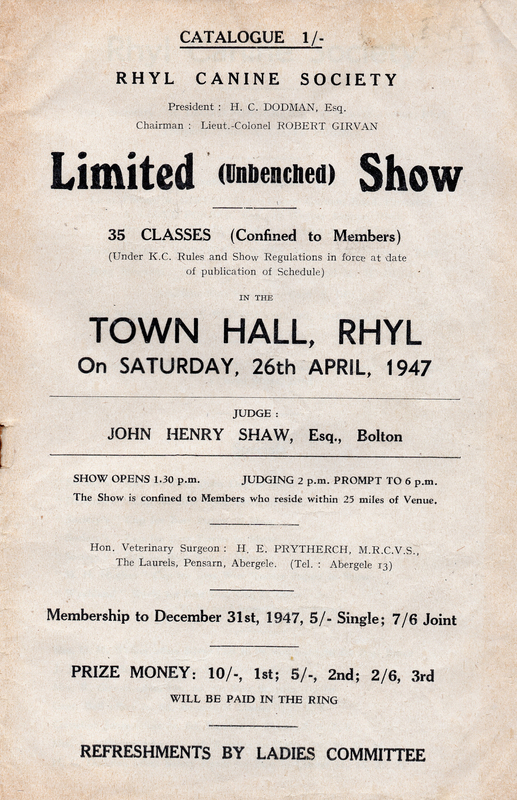 If dancing wasn’t your thing there were advertisements for the many cinemas in the vicinity: the Plaza, the Regal and the Odeon in Rhyl, the Palladium and Scala in Prestatyn and the Luxor in Abergele. 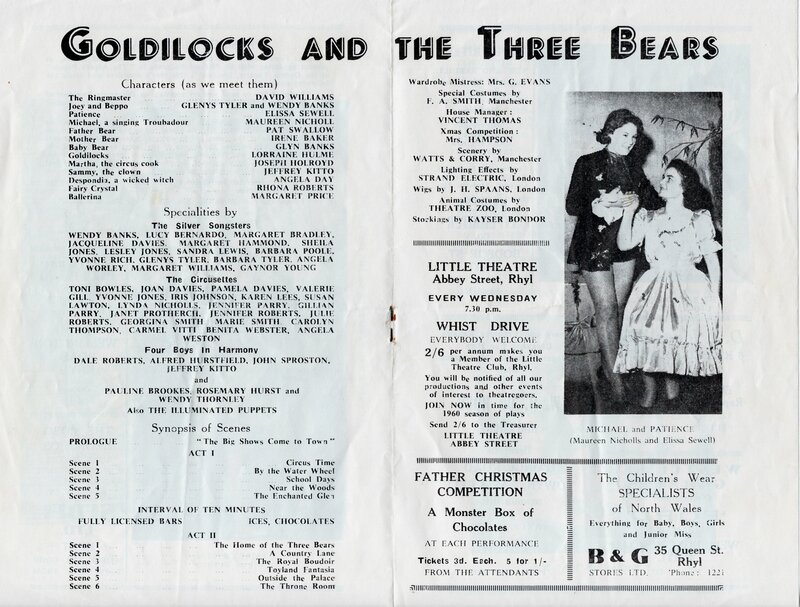 The front pages of the Journal throughout December featured advertisements for the Rhyl Children’s Theatre Club’s fourteenth production – “Goldilocks and the Three Bears” to be held at the Queen’s Theatre. It ran from December 26th until January 2nd, twice daily. 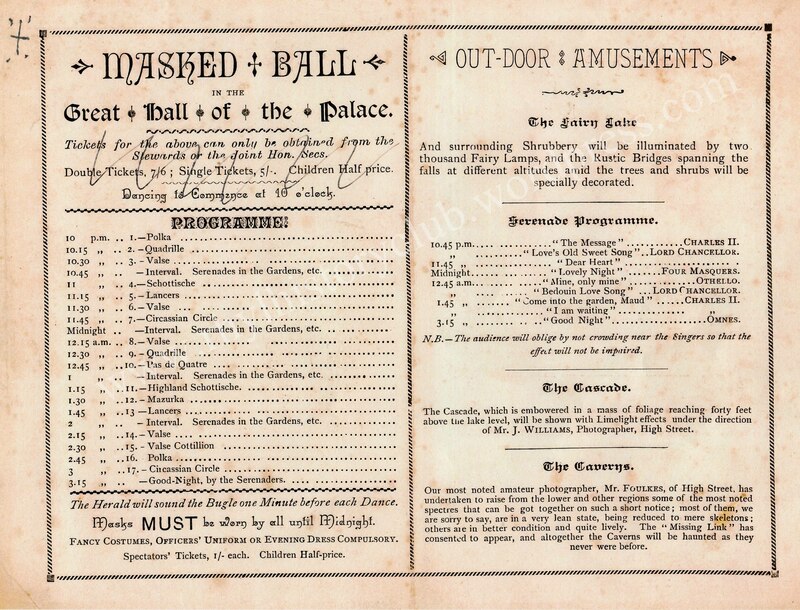 The Club had put on fourteen performances in front of splendid audiences. 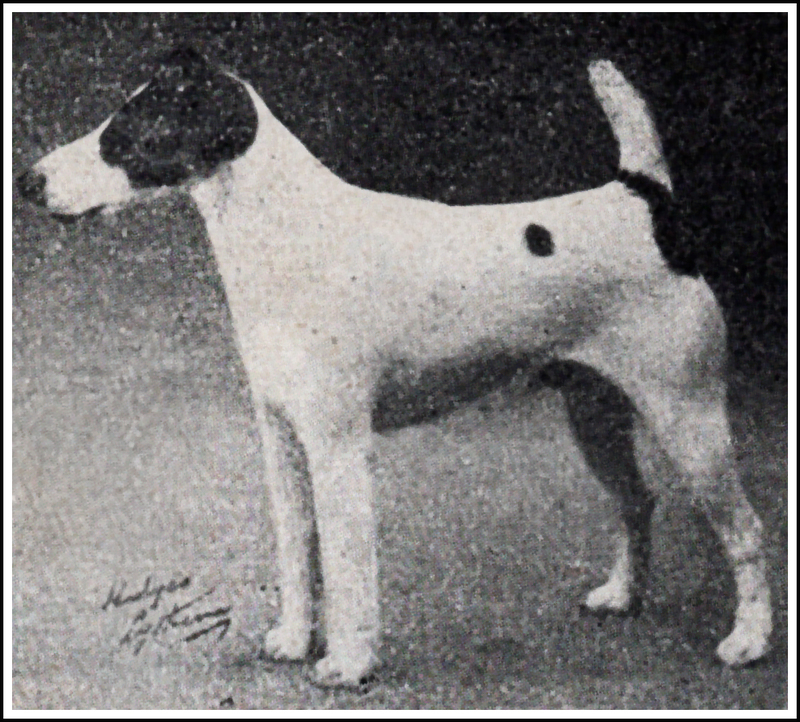 Mr Holroyd finished, amid applause, by saying that the Pantomime for the following Christmas, 1960, would be “Aladdin”. 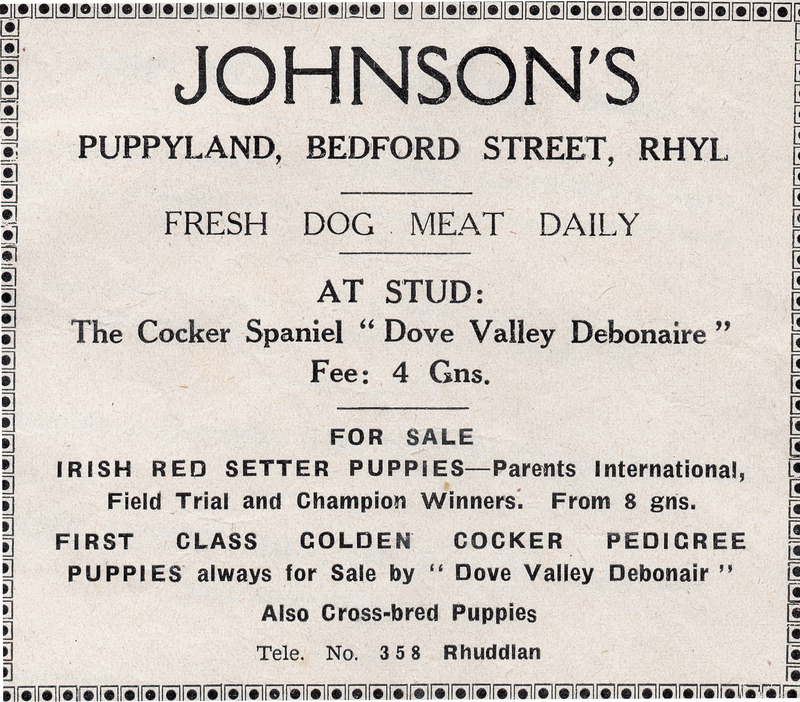 We’re straying outside Rhyl and into Rhuddlan for this week’s post. The photographs below show two Winged Wheels in Rhuddlan – it is very unusual to see two Winged Wheels opposite one another in one place. There are none known in Rhyl and the nearest Winged Wheels to those in Rhuddlan are in Mochdre and Corwen. What are “Winged Wheels”? They are artefacts from the Victorian era, more specifically from the brief period when bicycles were the fastest form of road transport, and before the dominance of the motor car. 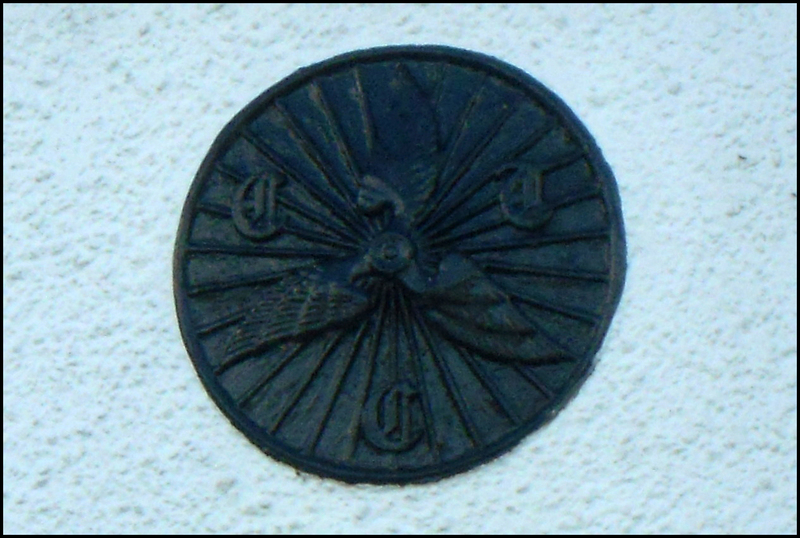 They are heavy, cast iron plaques, 24″ (61cm) in diameter – the badge of the Cyclists Touring Club, and they can be seen on buildings all over the country. 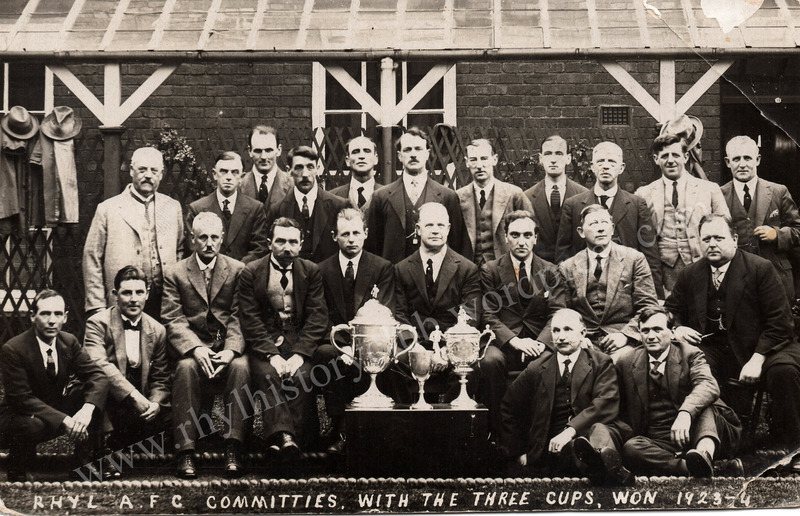 The CTC was founded in 1878 as the Bicycle Touring Club and was subsequently renamed the Cyclists’ Touring Club, which is still in existence today. In the 1880’s and 1890’s cycling became very popular with the professional classes with the invention of the new “safety bicycle”. These cyclists had influence and money to spend, and they demanded a grading system for Hotels and Inns, and also discount. Proprietors of such hostelries added “CTC” to their advertisements to encourage cyclists to patronise their hotels, cafes and shops. 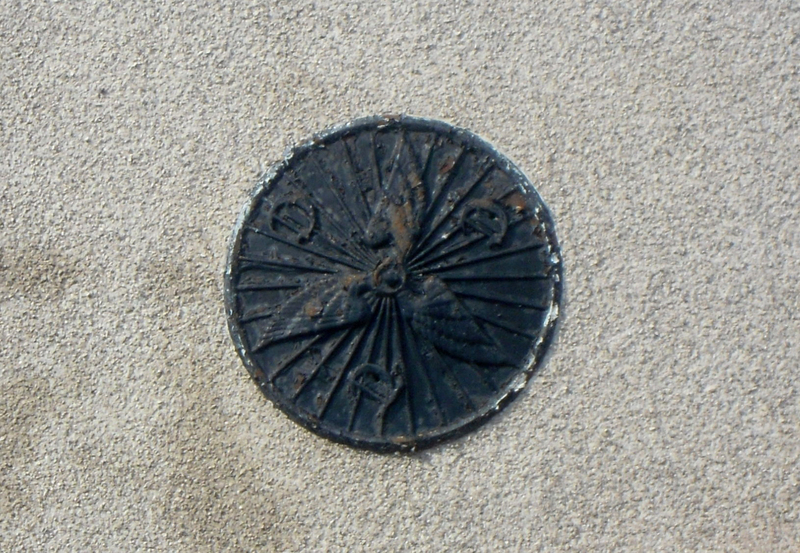 By 1888 the Winged Wheel became the official endorsement of the CTC, to have one adorning your premises was the ultimate accolade and it demonstrated that you welcomed cyclists and provided the facilities that cyclists might need. The Wheels were issued to be painted black with white wings and lettering. 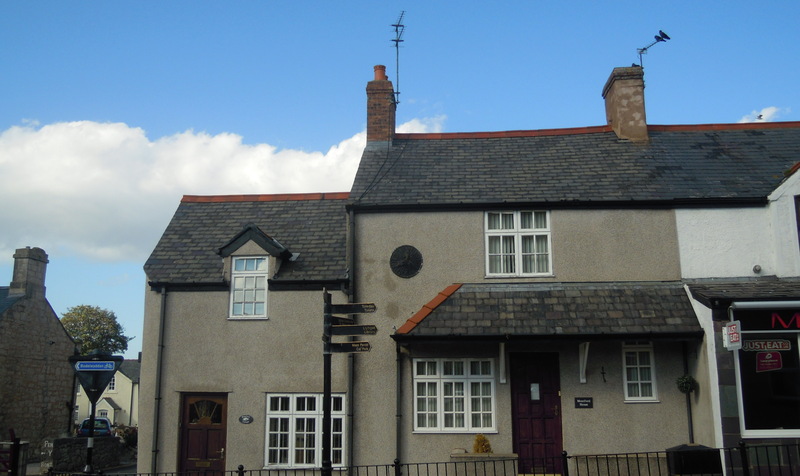 One of the Rhuddlan Winged Wheels is on The New Inn, the other is on a private residence. Does anyone know the history of this building and why it might have displayed the Winged Wheel? Does anyone remember any Winged Wheels on buildings in Rhyl which have since been removed?